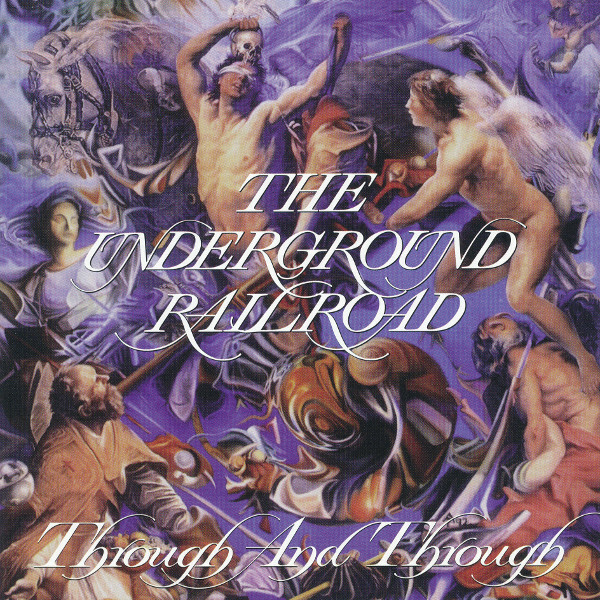 The Underground Railroad was formed with the express intent of playing music in the style of Genesis, but they have luckily strayed from the strict observance of that intention. There is a remnant of Genesis in the arrangements, the way the guitar and keyboards mix, but Bill Pohl’s guitar playing isn’t much like Steve Hackett’s, and Kurt Rongey uses keyboard voicings that don’t sound like Tony Banks. All in all, there’s a slight jazz-fusion edge to the playing, a bit of wandering outside the tonality of the songs. The album was recorded in a very piecemeal fashion – keyboard and backing guitar parts with drum machine first, then (when they added drummer John Livingston) real drumming, then (when Matt Hembree was hired) bass parts, and finally the vocals and lead guitar parts. The whole process took several years, so it’s amazing the music sounds so natural, as if the band had actually played it all together. The up side of the process is that the compositions are highly polished, almost like the band had developed them during years of live performances. This is one of the better neo-prog efforts of the last few years, taking the best elements of first-generation pioneers and updating them without losing sight of what makes progressive music appealing: a sense of adventure, instrumental prowess that serves rather than overpowers the songs, and a willingness to work outside the borders of accepted convention. Kurt Rongey has finally found a group outlet for his advanced Canterbury and symphonic based ideas. Much like early Echolyn with Holdsworthian guitar blasts or similar to jazz inflected Scott McGill's role in Finneus Gauge without as strong a vocalist. Thus there's a strong link with UK and Bruford band material (circa One of a Kind) where Dave Stewart handled much of the arrangements. Guitarist Bill Pohl and Rongey have roots which stretch back several years including Pohl's lead guitarwork on "Long, Dark Corridor" from Rongey's first solo album, Book in Hand (1991). "The Comprachicos of the Mind" is a prime indicator keyboard wise, giving rise to Happy the Man and UK comparisons. Probably the most outstanding tracks are "The Doorman" where Pohl and Rongey unison leads within unique chord variations and tempo changes. Plus the album's title track is a strong summary piece which highlights the strengths of the group. I don't sense a strong Genesis vibe throughout the disc (comparable to that up San Francisco's Metaphor), but that's only due to the prominent use of variant keyboards throughout. Too bad the group didn't also include their excellent Egg cover from Mellow's Canterbury and Beyond tribute. Compositionally the group has far more complex roots and influences than Iluvatar or other neo-prog examples, which could explain why it's taken so long to arrive at this completed work. Overall, this is the best US progressive release since Discipline's last studio release and my safest bet for prog album of the year. While this debut is impressive for its compositional savvy and great arrangements, one needs to remember that two of the main movers in this four-piece unit are guitarist Bill Pohl and keys-man Kurt Rongey, both having had at least critical success on several previous solo albums. So does that make this a supergroup of sorts? OK, maybe that’s a stretch, but on every track beginning to end it’s obvious that these guys are no amateurs. Using a palette of guitars, bass (and bass pedals), multi-synths, drums, and vocals, the compositions herein are angular and employ an abundance of dynamic contrasts, shifting key signatures, and frequent use of dissonance. While three of the six tracks are 10+ minute multi-part epics in the best prog tradition, nowhere will one find these guys falling back on the standard clichés; indeed the material and arrangements here are some of the freshest, most original this writer has heard in some time. Some influences in evidence might be Genesis, Van der Graaf, and other bands in the early Charisma camp. The vocal parts (note that UGRR’s music is predominantly instrumental) are strongly reminiscent of Happy the Man’s vocal material, or Italian band Leviathan’s Bee Yourself (is that an obscure enough reference?). In summary an exceptional, challenging, and surprisingly accessible debut, which this writer can wholeheartedly recommend.